I have been working so hard in the garden that it's been difficult finding the time to photograph it. Thus, this post is a little photo-heavy because I have a lot of catching up to do! My water feature garden finally filled out and I have a lot in bloom to look at through my kitchen window. Right now the foxgloves, daisies, sedum, perennial geraniums, astilbe, and purple campanula are all blooming in this garden. I used to have Shasta Daisies, but they all died out when my garden went to weed; I do still have a lot of Marguerite daisies left. These are pretty flowers, but they are a nuisance as they reseed everywhere...and I mean everywhere! 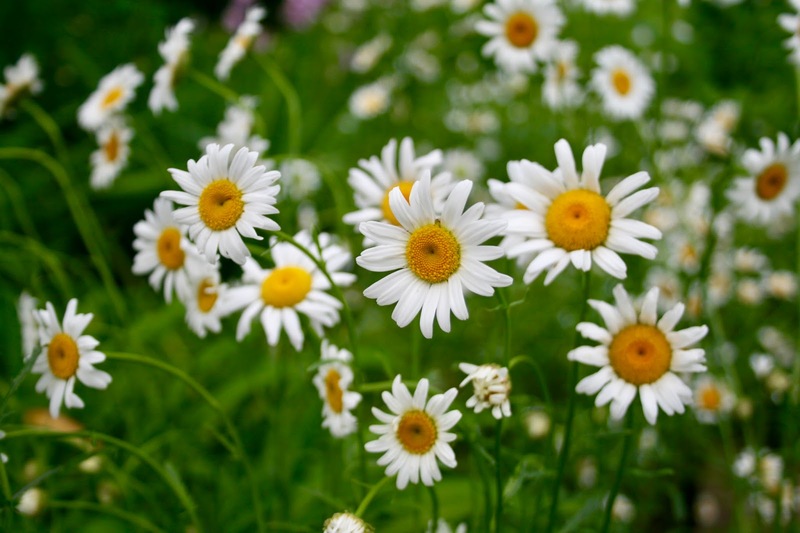 As I slowly restore my gardens, I plan on buying some Shasta Daisy plants and putting them back in my garden. I prefer the Shasta Daisy over these little ones, any day! This is my favorite sedum. I have it everywhere in my garden. 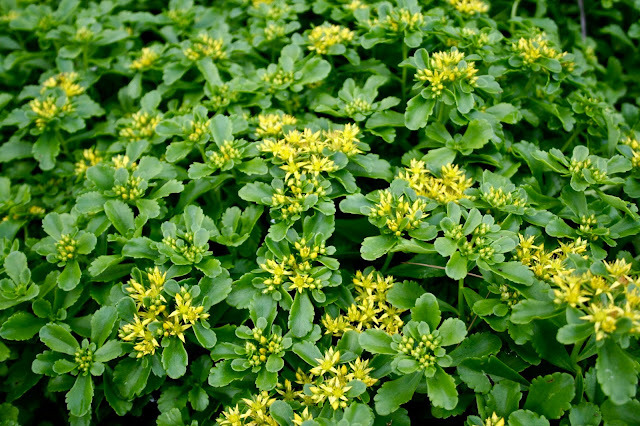 It is such a pretty green and I love it's yellow flowers in the spring. Nothing kills this plant! 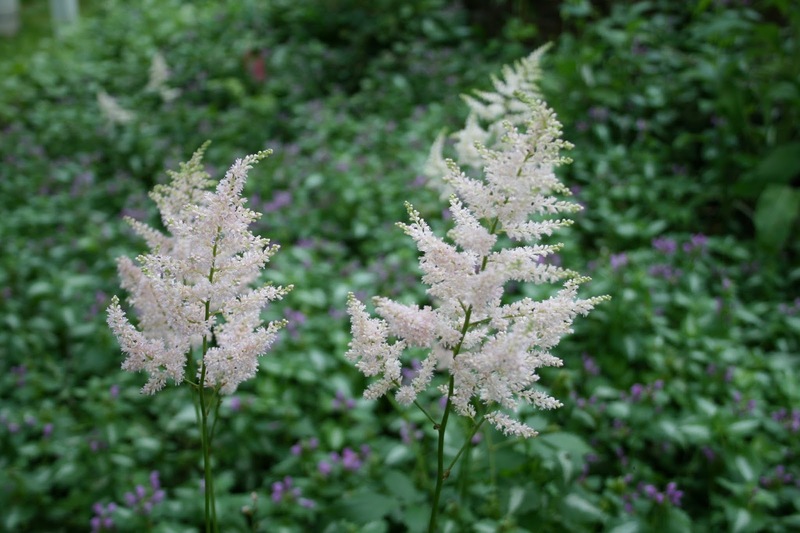 It too reseeds and pops up everywhere, but it's not invasive and it's very easy to pull out. 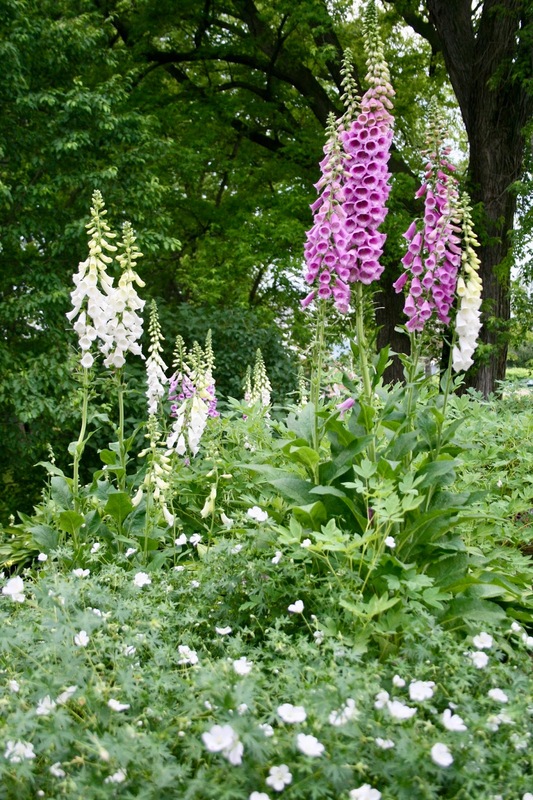 Purple and white foxglove grow tall and beautiful in this garden with a hedge of white perennial geraniums beneath. 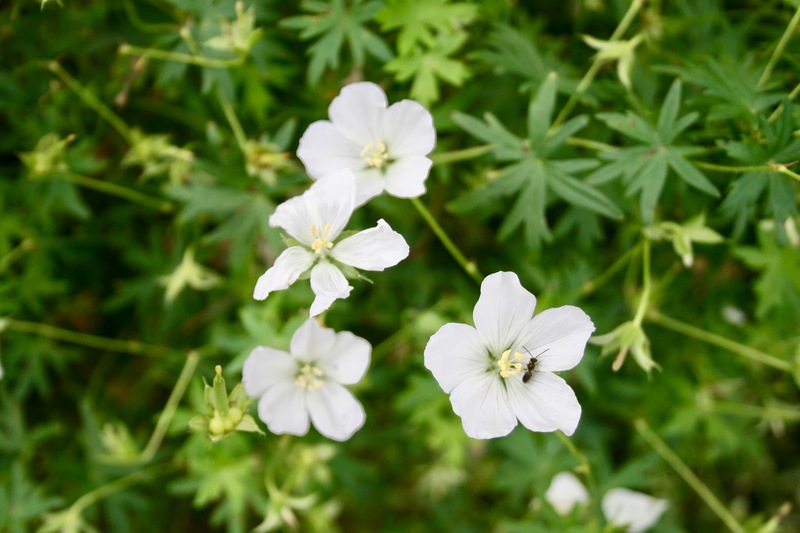 Here is a close up of the white geraniums (ant included). I have perennial geraniums in many of my gardens. This is the white variety, but I also have pink and blue. 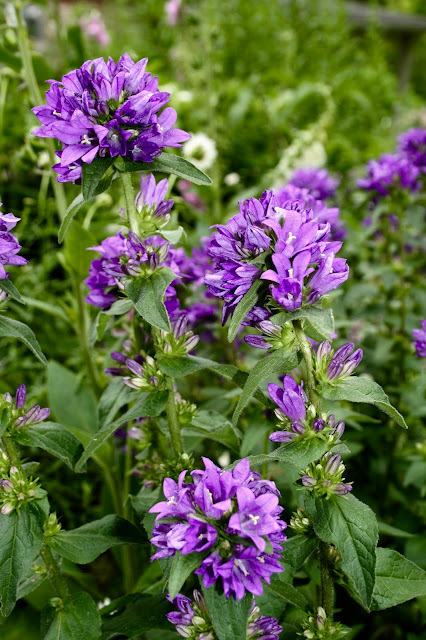 Purple Campanula is such a pretty flower. It also likes to reseed and pop up in unexpected places, but it's not invasive. My astilbe has not been doing well the past few years because it's getting choked out by lamium. 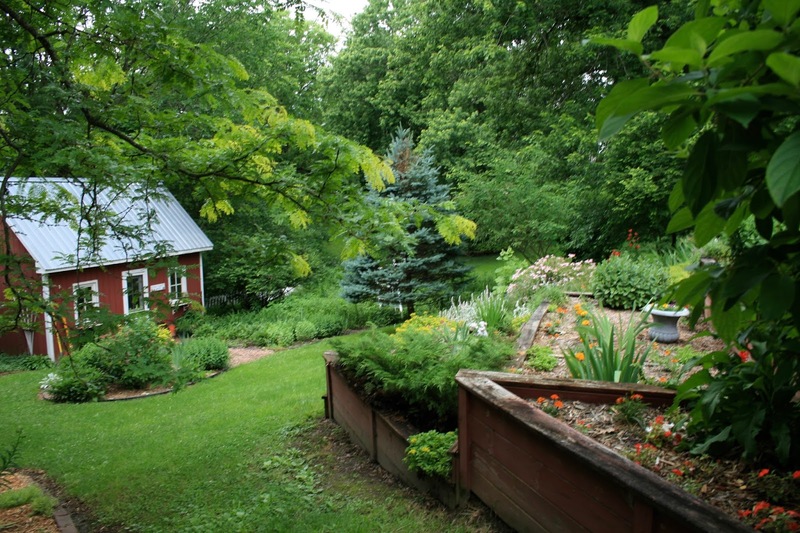 I need to re-do this garden next year, or this fall if time permits. 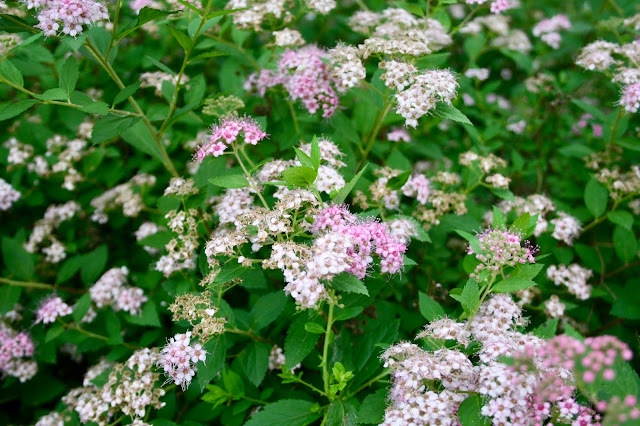 The spirea bushes have just started to bloom. I have several different varieties. This one is called "Little Princess". My Southern Retaining Wall Garden is located at the back of the house. (We are currently working on our roof this summer, going from shingles to steel!) Here I have planted a lot of marigolds, Stella-d'ora daylillies, peonies, sedum, rose champion lychnis and more foxglove. 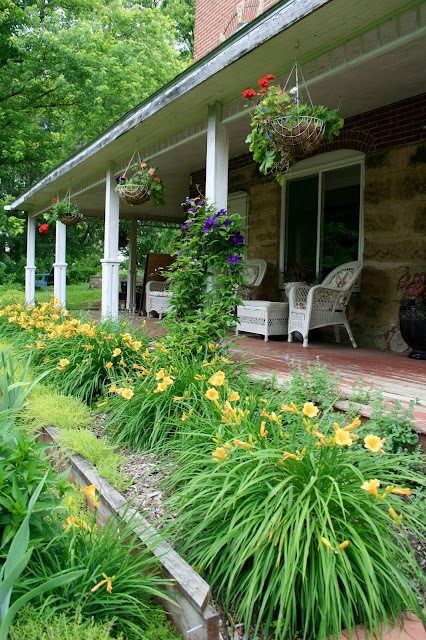 I have the Stella-d'ora daylillies planted in a row under the back porch. 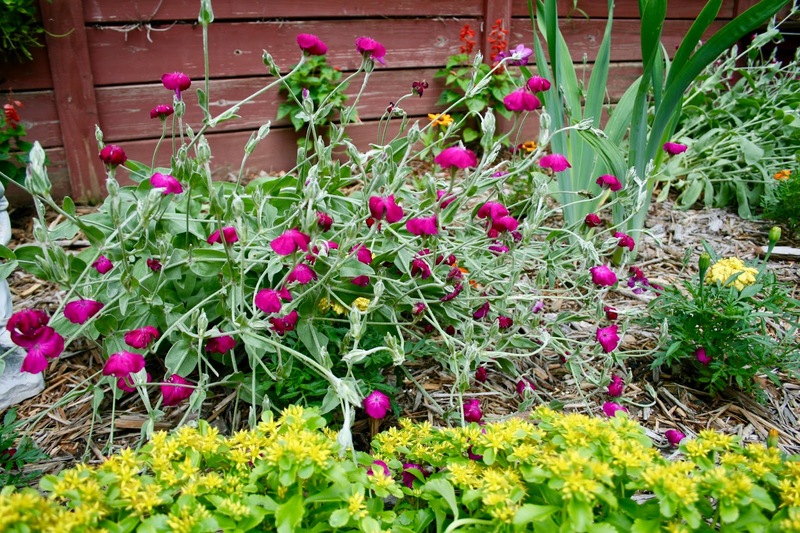 My rose campion lychnis was looking so beautiful the day before this picture was taken. Then we had a nasty rainfall and it knocked it over onto the ground. Ugh! I wish I would have taken a picture before the rainstorm. 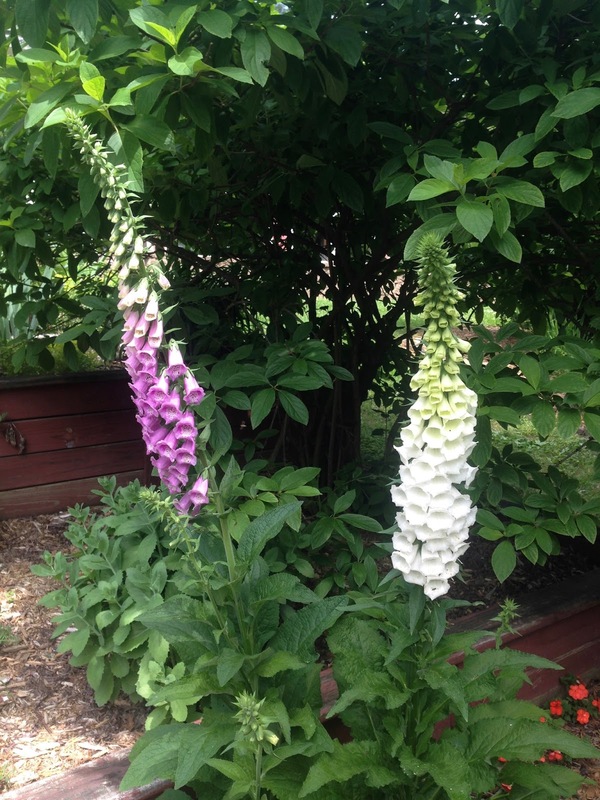 There is more foxgloves blooming in this garden under a viburnum bush. Foxgloves love part sun. 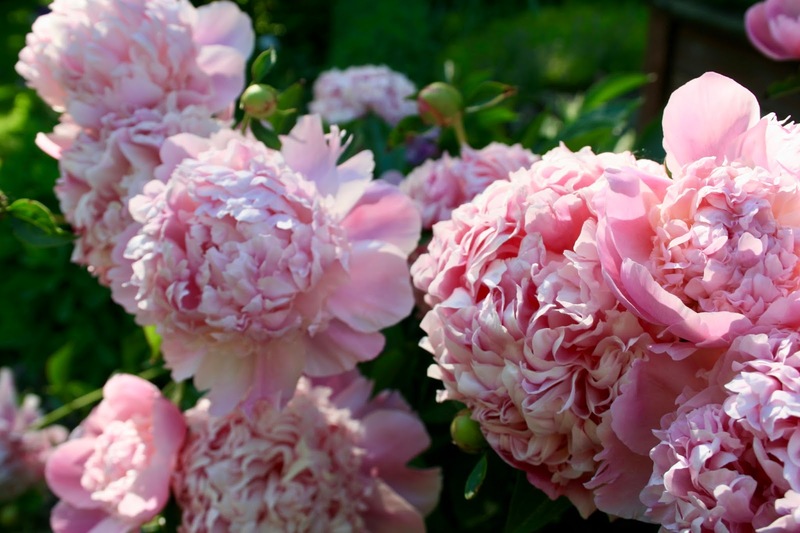 In my last garden post I showed all my early blooming peonies, which are mostly large, singular blooms. The double peonies, like the ones below, bloom later. I have many of these bushes scattered throughout my garden. 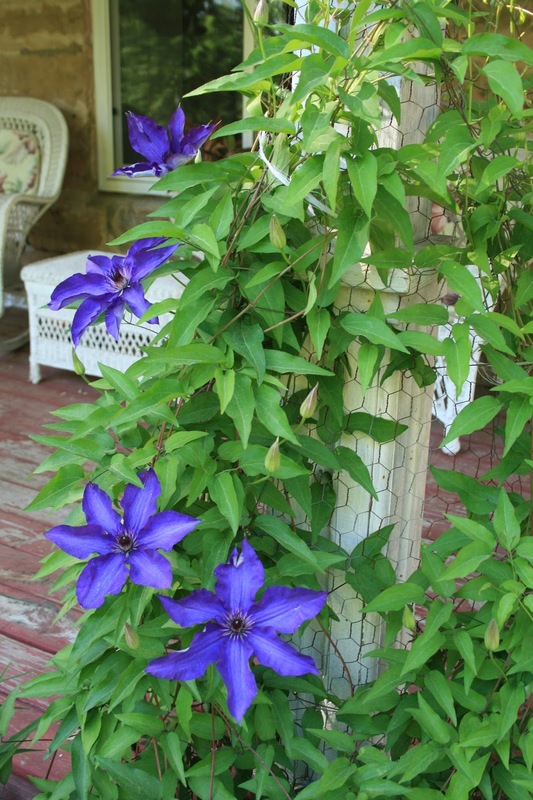 This is a gorgeous, large clematis that I have growing up a porch post. Now I normally do a lot of close ups of my garden flowers, but I wanted to show what I have been working on the past few months. Many of my regular readers know I use to have a very nice garden, but after a back injury and years of full time work my garden went to weed. I've been trying to restore it the past two years, but it will probably take another few years before I'm done. Last year I renovated the southern retaining wall garden (shown above) and this year I just finished re-doing my south east garden. 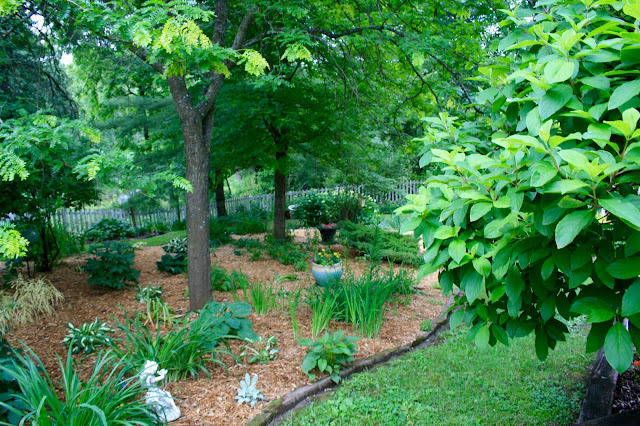 This is a large garden that used to be a sun garden, but now that the trees have grown and filled out, it's a shade garden. 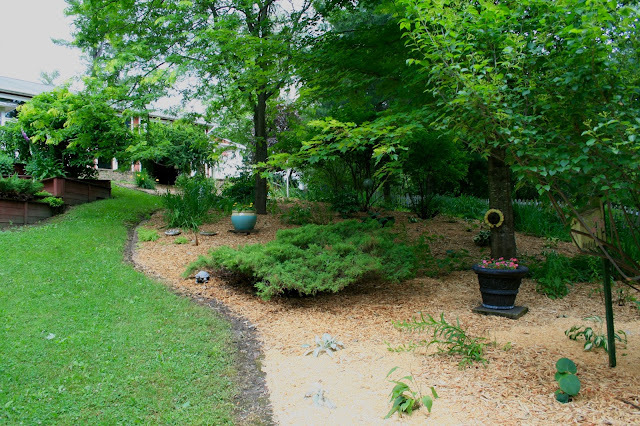 I dug out all the weeds and tall sun perennials and replaced them all with hosta and other shade tolerant plants. There's a lot more in this garden than it looks. Next year, these hosta will really grow and fill out. I didn't want to over-plant and have to thin things out a year or two from now. In the mean-time, as I wait for things to fill in, I added a lot of large pots and garden ornaments. 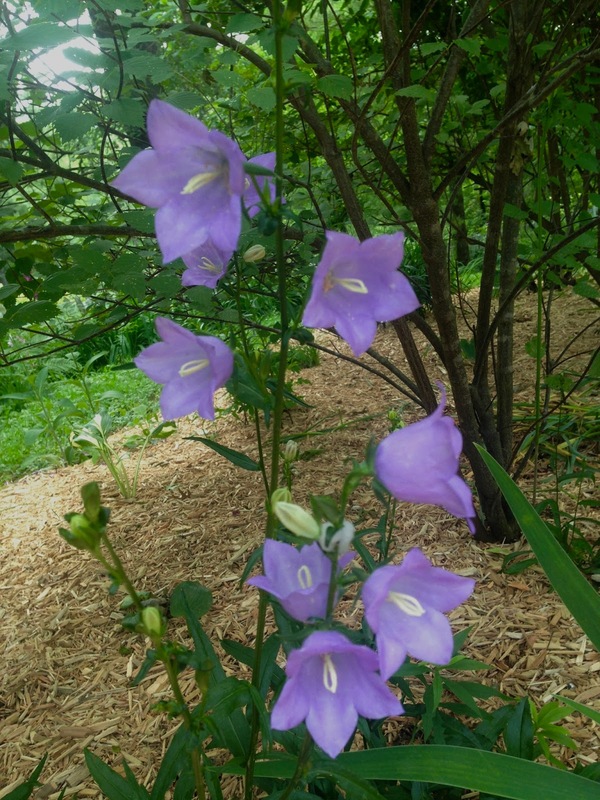 I was so happy to spot this pretty purple bellflower growing in this garden. When I was digging in this garden I couldn't figure out if it was a perennial or a weed. I thought "I'll just leave this here for now and see what happens." Then when I saw these pretty blooms, I was estatic! I couldn't believe they survived all these years amongst all the six foot tall weeds. Aren't they just the cutest flower? 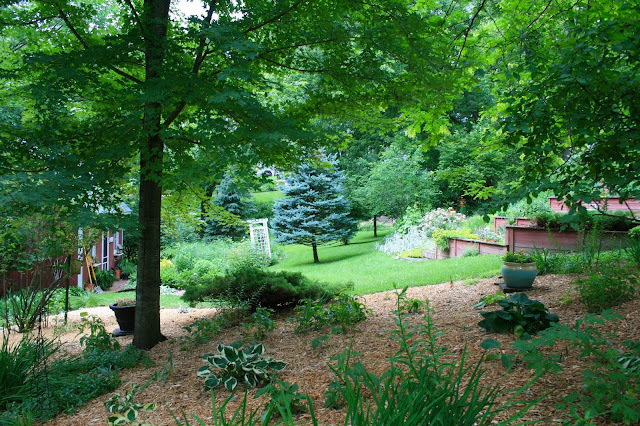 I love this garden because there are several tall trees and lots of full-grown shrubs. I trimmed all the shrubs so that there is no undergrowth and I can see well across the yard. I absolutely love walking on the grassy paths in my garden. Now that the tall perennials are gone, I can see the river on the other side of my fence. (Ignore the fact that the fence needs a fresh coat of paint. It actually is rotting, and falling over and needs to be replaced. I don't want to re-paint it when we will be taking it down sometime in the near future). 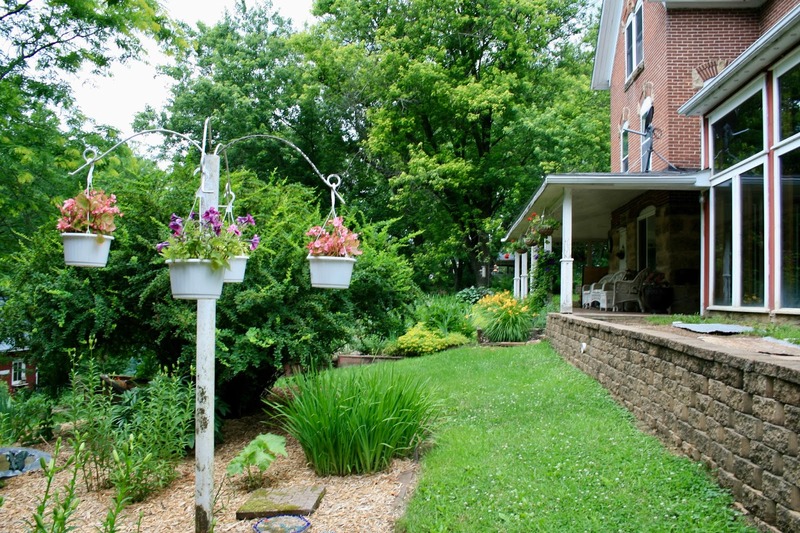 I placed hanging baskets and a bird bath in this garden as well. The baskets are located right in front of our sun room so I have a great view of them from inside the house. Here is one of the large pots I put in this garden. This area gets the most sun, so I was able to plant marigolds in it. My other pots get more shade, so then I planted impatiens or coleus in those. Now that I have so many established trees and shrubs in my garden than when I first started gardening years ago, there are so many interesting and surprising curves and spots to explore. I can just picture the grandchildren hiding amongst the foliage. So now the south east portion of my yard is done! Whew! 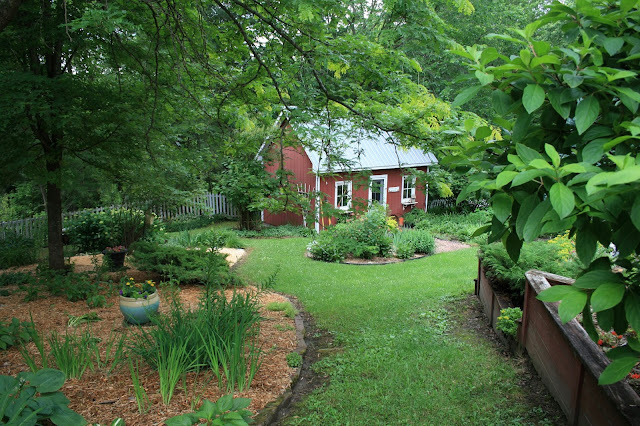 Now I will move on to the next big garden, and that is the one in front of my garden shed. Last year, I renovated just the small portion to the left of the garden door, and this year I will start on the rest of it which extends far west (to where the blue spruce is and a little beyond) and a little further south. 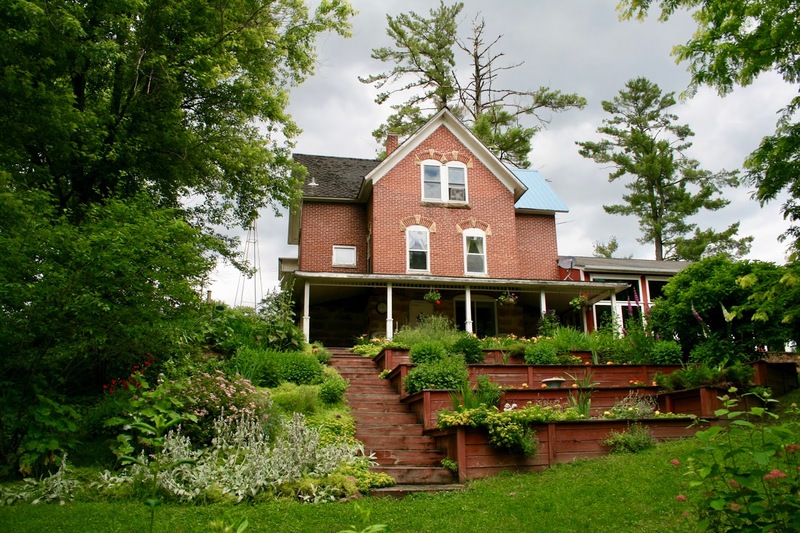 This garden is mostly a sun garden. Some of my Asiatic lilies started to bloom already. This pretty red one and a rare peach version. Isn't this peach lily gorgeous? 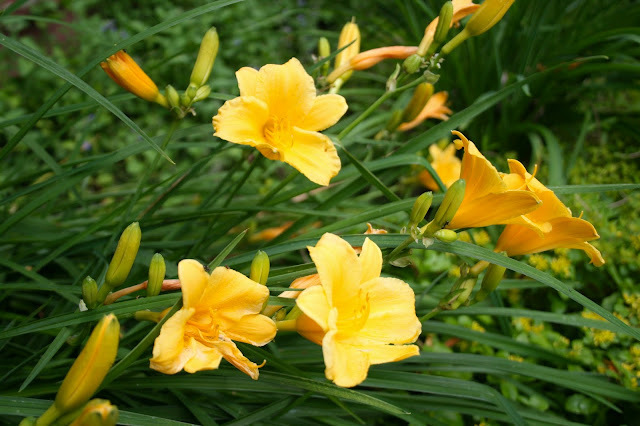 It is one of my absolute favorite lilies! And finally, another clematis. 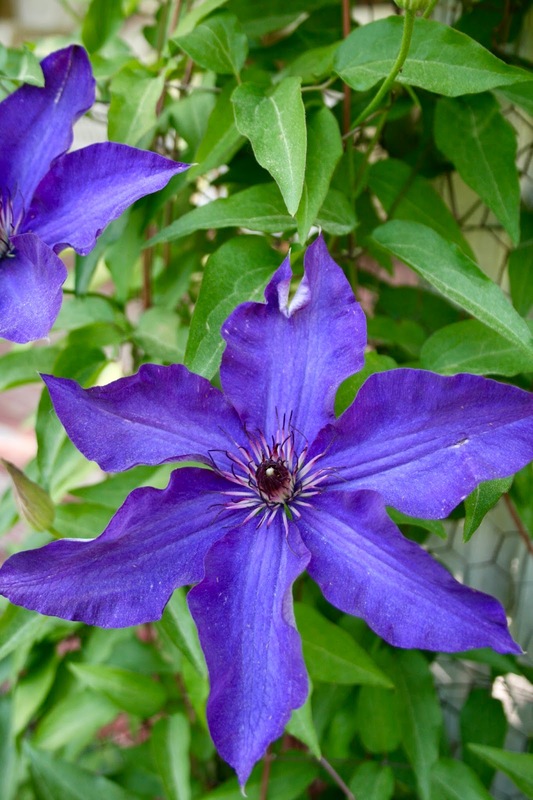 This is the traditional smaller, singular bloom clematis. It is growing on a trellis in the south sun garden I will be renovated. 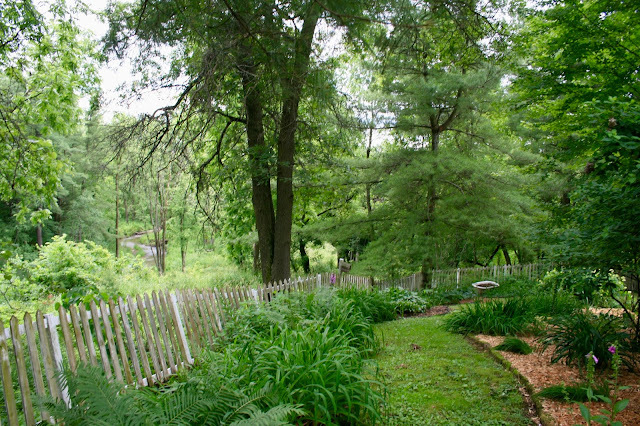 It's been a lot of work restoring these gardens. I spend about six hours a day outside right now. I don't know if I'll be able to keep up that kind of pace in the heat of the summer. But I feel I'm starting to see light at the end of the tunnel, and it keeps me going! Wow, that six hours per day is really paying off. Your garden is so beautiful. What do you do with the clematis come fall, do you cut it right back? 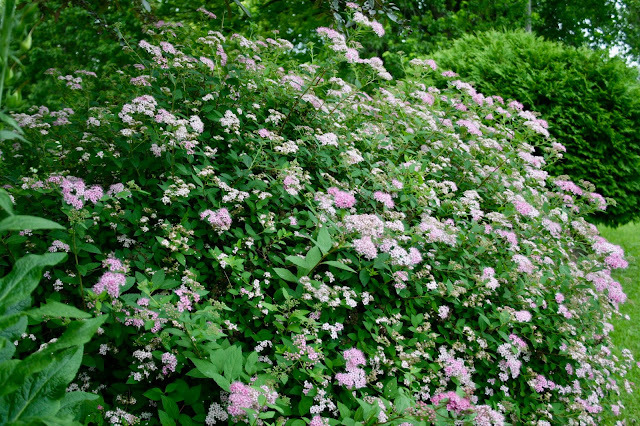 I hope to plant one in our new place but I have read differing advice on how to maintain it. Thank you! I have tried both ways with clematis (both cutting it back to the ground, or leaving the old vine up through the winter). Either way works, and I didn't see a difference as far as the growth of the plant if I left it alone or cut it back. I prefer cutting it back to the ground because otherwise I have to look at dried up leaves and stems until the new growth takes over. Oh, Amy, what a lovely post. You are an artist. In your sense of style, in your paper crafts and in your gardening. 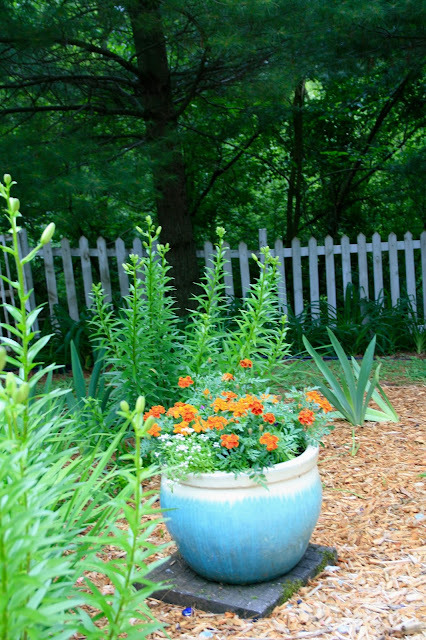 You are recreating such special space through your gardening. I know what back-breaking work it is, and we have such a tiny yard by comparison. I am impressed with how you can identify and name all of your plants! There are so many varieties! The clematis (smaller blooming variety) reminds me of my childhood home. My mom had it growing on the pillar-supports of our carport. Love the little bluebell that came back once its area had been thinned out. And the daisies are so sweet. Maybe you can keep a few of them as you replace them with the Shastas. Thank you for sharing this pretty corner of your world. I feel like I know a little bit more about Amy now! Wow! Thank you! What a wonderful compliment. I've been told I'm artistic before and I always shrug it off because I compare myself to truly artistic people and I don't feel I even come close. 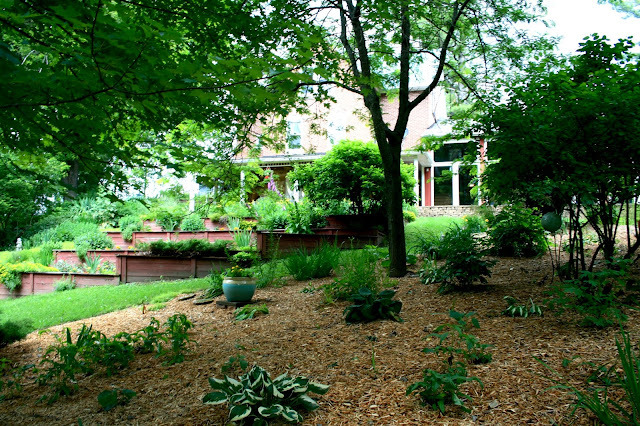 But your right, a beautiful garden is part back-breaking labor and an artist's touch. It really takes both! I always love seeing your garden. It's amazing and it's huge! The foxgloves are gorgeous as are the peonies and everything else in your beautiful woodland garden. Know what you mean about that invasive lamium. You are a brilliant gardener! Aww, thanks so much! Yes, it is huge, that's why I'm trying to make it less maintenance by using plants that don't invade, reseed, or have a host of other issues. Amy...this is amazing!!! What a retreat you have in your yard!! I love looking at all of this, but for some reason my talent does not extend to plants. Heck...last year we killed the mint. And everyone says you can't kill mint! Well we did---ugh! Thanks Jodie, that's pretty funny about the mint...it is pretty hard to kill. You must have had it in a shady or wet area. It loves hot, dry spots. But I have a lot of mint growing in shade too...but it's dry shade. Wow! What a gorgeous place. I know it must be a lot of work, but it sure does pay off. You've created a magical place. Thanks for sharing your photos -- great inspiration. Your garden is STILL gorgeous even though you say its gone to weed. I love every angle. Ha-ha, that's because none of these pictures show the gardens that have all the weeds. 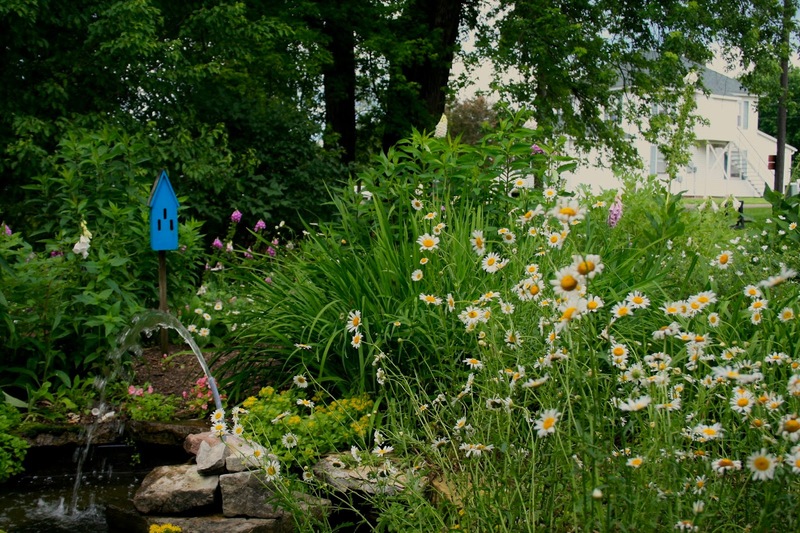 These gardens have all been redone or weeded.